The plan when I started telling you about our new house was to give you all the little details every few days. You know, fill you in on the ins and outs of construction and pictures of what we have going on in each stage. Well that's just working out dandy isn't it? Somehow life seems to keep happening while I plan differently. Mainly the fact that we have full time jobs, mine that keeps me out of state three days a week, and a house that we're trying to get ready to sell. I swear every time I really get on a roll with my to-do list, hubby or one of the contractors will call and I get pulled over to the new house. Decisions to make, something to pick out, and let's get real. I love the process of designing this new house, so when I'm asked to stop organizing, purging, cleaning and staging the current house, well I kinda get distracted. We're so close though! I'm hoping we'll be putting our current house on the market very shortly. Anyway... how about an update on the state of Gateway House. It's been painted! I've had mixed reviews about my decision to paint it white. Some adore it, some ask me if this is primer, and some just straight out tell me they don't like it. I'm really ok with all of that, because I think it's fabulous! I took this picture today while it was very cloudy out, so the true color probably isn't represented well, but it's Benjamin Moore's White Dove. I love White Dove!! When placed next to plain white, it reads just a tad yellow. But on it's own, it's a perfect warm and cozy white. If you were paying tons of attention in my video post, you may remember that I said all the window bump-out areas would be a grey-ish color. Obviously not. We had planned to use Sherwin Williams Sea Salt in those areas, but when the white went on I just kinda had an excited fit. I wanted it all white so badly that my wonderful husband did what he's been doing with this entire house. He said "if that's what you really want, let's do it". How sweet is he!?! We'll be using the Sea Salt paint, that had already been purchased, in a different area that I'll show you later. I do feel like it's a teensy bit plain right now, but that's because it's missing what I like to call the "jewelry". The lights, the garage hardware, the shutters, and the painted front door! I've been at somewhat of a loss to what color to paint that front door, but I asked my wonderful Instagram community that very question today and got so many amazing ideas I can't wait to check out! Thanks IG followers!! I talked a lot about the plan for the fireplace in my last post, and it's really come together. At this stage the shiplap on the walls and fireplace is up, as well as the beautiful barn doors our trim carpenter made from scratch. 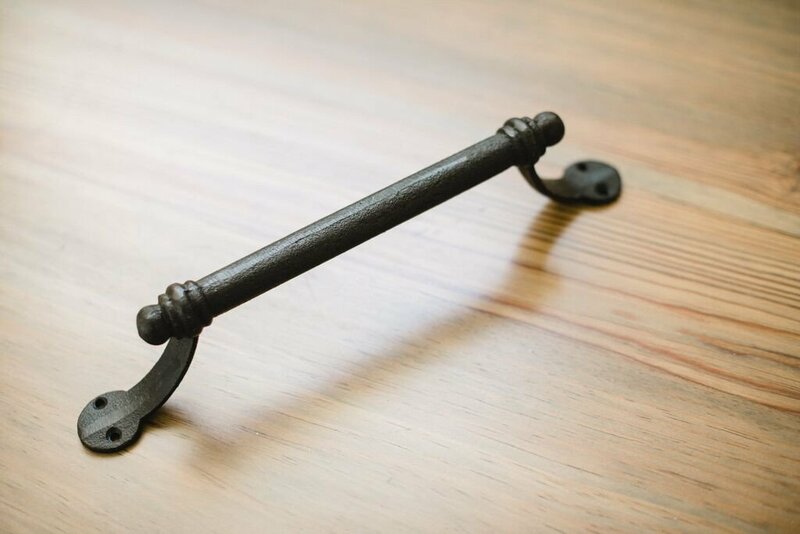 The door pulls are my absolute favorite! I ordered them from Magnolia Market online after seeing them when we visited their shop this spring. The shiplap only goes just over half-way up the wall, while continuing to the ceiling on the fireplace bump-out. 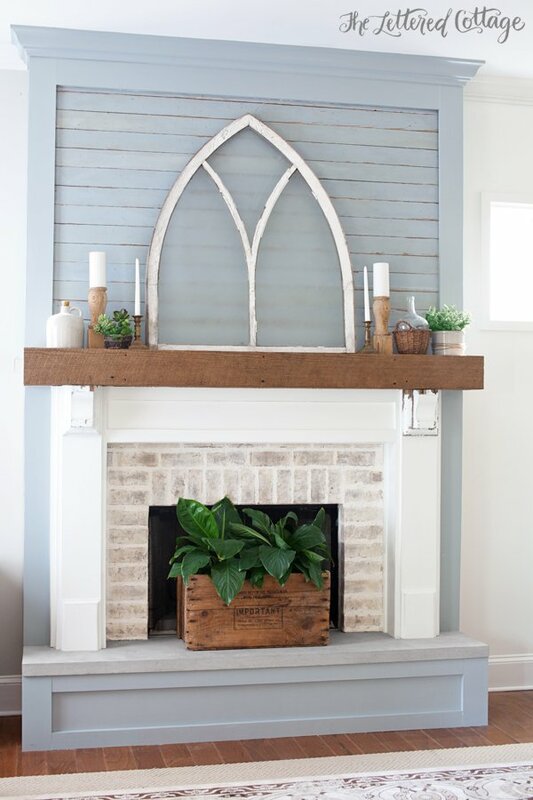 Even though I adore shiplap and would love it everywhere, we felt this would help to accent the height of the fireplace while also saving the budget just a tad. The brick... This was one of those things that make people say they don't wanna build. Just little frustrations that leave you scratching your head! 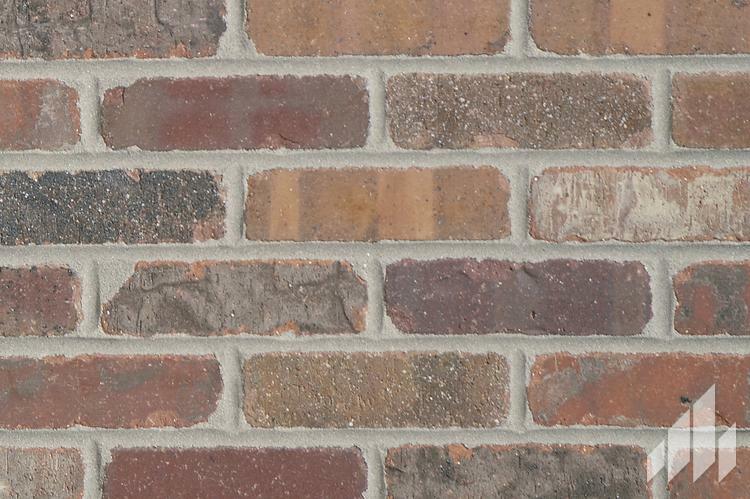 We picked out a thin brick called Peppermill, and chose it for it's rough tumbled look and color variations. See anything wrong in the picture below? How much color variation do you see? 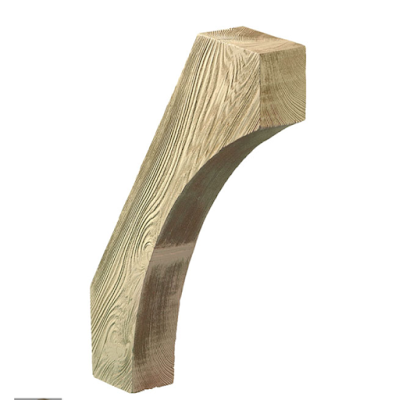 The picture below is what Peppermill is supposed to look like. Not even close, huh? We had two sealed boxes very clearly labeled Peppermill that our mason had already installed by the time I saw it. I called the brick company to complain and sent them these two photos, and they also looked at the sample in their own showroom that we chose from. With much chagrin, they agreed that I wasn't wrong. What we were given looked nothing like Peppermill. They offered to have us come in and hand pick bricks for our job, then offered to speak with the mason about paying for the overages it would incur to rip this brick out and place the new brick. It was very kind and professional, but after much thought, we chose to leave it as is. The time it would take to hand pick bricks, get the mason back over there to tear out and start over, not to mention I was getting ready to head back out of town for work, well, we made the current ones work. The plan had always been to use a white over-grout process (or messy grout) and we hoped that would give us the variation we were looking for. I can't say what it would've looked like with the brick we originally wanted, but I can say that I'm happy with how it turned out. This is where the house sits right now. Painting stage. The painted trim has been completed and they've started priming the walls and staining the few things that get stained. Oh, backing up just a bit. 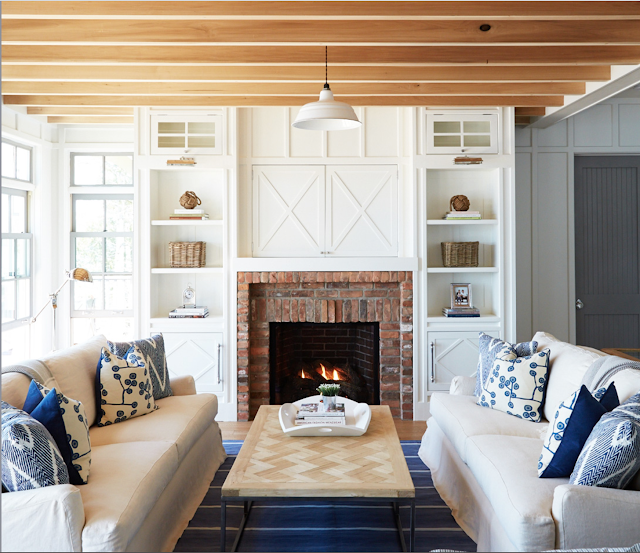 I need to show you the ceiling and barn doors in the great room! It's just simple pine boards, but we love the accent they add. And the barn doors there on the left. They cover a cased opening to the craft room which will be open most of the time to let in the light, but can be closed when that room is used for guests who need their privacy. Most of the kitchen cabinets are in as well, with the exception of a few errors and changes that've been made. The perimeter counter tops have been placed, along with the cabinets. We chose Bianco Marina Quartz which mimics the looks of marble. Marble is a beautiful material, but it stains something awful. Quartz gives a very similar look, but is much more durable (or so I'm told, it got rave reviews with our counter-top lady, as well as my Instagram friends). I'll take a picture of it when it's not covered in dust or plastic and let you see. One of the things that was missed when our cabinets came in was the backing on our island, and the side panel for the fridge. That small lower cabinet pictured below will have to be completely taken out and replaced with an even smaller one to accommodate the side panel. After that comes in, trim will be added to the upper cabinet. The change I'm making is to those open upper cabinets. They aren't supposed to be open, but covered with glass doors that have a grid. This is what the doors looked like when they arrived. I gotta say, I felt like they were squinting at me. I thought I was getting doors like the picture below, so I was highly disappointed. We have a few options to get this look. There may be doors from a different manufacturer that have a larger opening, doors could be made on site and painted, or we can even scrap the windows and use solid panel doors like the rest of the cabinets. All I know is the squinty doors didn't stick around long and they won't be returning! Ok, if you've stuck with me this far, I just have one more thing to show you, and it's pretty fabulous! This is the opening from our master bedroom to the master bathroom. We found an antique walnut door from the 1880's that was originally part of a set of 4 pocket doors. This thing is huge! About 3 feet wide and I think around 8 feet tall. It has varying amounts of the original stain left on it which I plan to strip back to the original wood and finish with Hemp Oil to protect, hydrate and bring out it's natural beauty. Well that's all for now. I will attempt to update you guys more frequently from here on in, in hopes of giving more of the fun details, and to prevent each post from turning into a small novel. I'll cross my fingers for that, but please, no one hold your breath.